Modern. Rugged. Bold. The new 2019 Jeep Cherokee is here, and you can find it at Landers Chrysler Dodge Jeep Ram of Norman. The newest Cherokee boasts a striking new exterior design, and it takes adventuring to another level. This is a vehicle that can fit in with the daily commuters and keep up on the backroads. With a host of convenience features along with classic Jeep brand styling elements and capability, the 2019 Jeep Cherokee is the perfect mix of modern & rugged. Landers CDJR of Norman customers come in from across the Oklahoma City metro, including Edmond, Moore, Midwest City, Yukon and Del City. The 2019 Jeep Cherokee had a makeover for this model year, and the new exterior design is sure to turn heads everywhere you go. The Jeep brand design is still prominent; it’s simply reimagined for modern adventure. The authenticity and craftsmanship of the 2019 Cherokee is apparent. The front and rear designs were updated to showcase the best features in a sleek, seamless fashion. The improved LED daytime running lamps and forward lights are now combined into one housing that subtly wrap around the fenders. The Cherokee also boasts a new wheel design and premium exterior convenience features that show off the evolution of the compact SUV. On the inside, state-of-the-art technology meets a refined and expertly crafted environment. It has more cargo space with better storage solutions, the newest Uconnect technology, plush fabrics, leather-trimmed touchpoints and more features you’re sure to love. The 2019 Jeep Cherokee does more than just keep up on the trails; it thirsts for adventure. Whatever conditions you’re in — rain, snow, mud, rocks — this Jeep is ready to perform. The Cherokee has never been one to shy away from a challenge, but the 2019 model is even more equipped with all-weather capability and the all-new available 2.0L Turbo engine that enhances performance and efficiency. 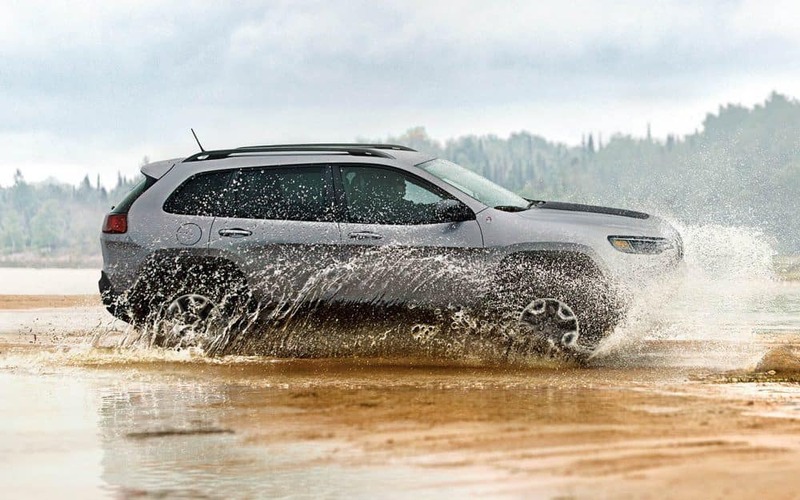 There’s no other car in its segment that can match the 2019 Cherokee in off-roading capability. The new Uconnect Off-Road package and skid plates make sure a little mischief is always on the table. The Trailhawk models offers a low-range gear in its 4WD system that allows the Cherokee to easily ascend a steep hill of loose dirt and rocks. Available Select Speed Control is like cruise control for low-speed rock crawling. With a 2019 Jeep Cherokee, there’s never any reason to leave adventure behind. With everything the 2019 Cherokee is capable of getting into, it makes sense that safety was a huge priority in designing this vehicle. With more than 80 standard and available safety and security features, you can leave your worries behind as you discover new worlds. Some of those safety features include available Blind Spot Monitoring so your vehicle has eyes where you don’t, ParkSense Front and Rear Park Assist so you never have to worry about backing into a crossing car, Passive Entry and Keyless Entry so you never have to fumble for your keys and so much more. 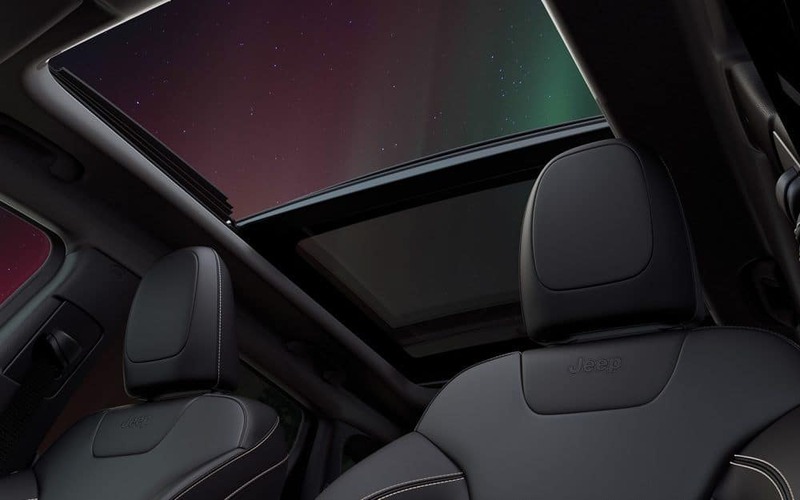 Whoever said excitement and safety can’t coexist has never ridden in a 2019 Jeep Cherokee. No matter where life takes you, the Cherokee offers security you can depend on. Whatever your brand of adventure, there’s a 2019 Jeep Cherokee eager to take you to it. Curious? To get behind the wheel of one of these adventure machines, stop by Landers Chrysler Dodge Jeep Ram of Norman. In the meantime, you can check out our 2019 Jeep Cherokee inventory online. Browse our 2019 Jeep Cherokee inventory online.